In the Arnold Classic 212 it was a titanic battle between Flex Lewis and David Henry with FLEX LEWIS emerging as the first ever winner of the Arnold Classic 212. And so it was David Henry in 2nd place with Aaron Clark placing 3rd. See some PHOTOS BELOW RIGHT. See the PHOTO GALLERY HERE. A special thanks to my good friend and long time helper at the Arnold Classic, JASON BREEZE, for these wonderful contest photos. This Men’s DVD #2 of 2 presents all of the classes of the MEN’S MASTERS BODYBUILDING, MEN’S CLASSIC BODYBUILDING and MEN’S PHYSIQUE. This event is similar to a World Championships of Men’s Amateur Bodybuilding, featuring the top amateur guys from the NPC and IFBB from around the world. See all of the lineups, key comparisons and callouts plus posing by the top guys, and all awards, plus the 3 OVERALL POSEDOWNS. 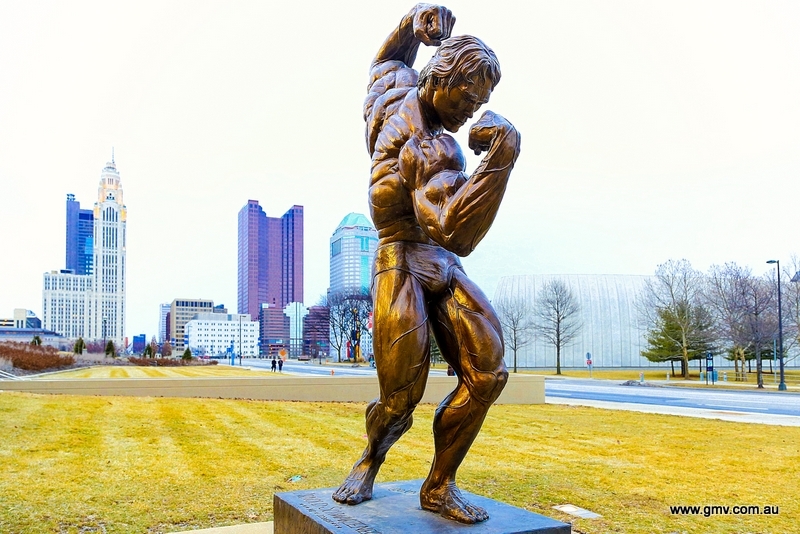 Arnold sculpture against the Columbus skyline, photo by Wayne Gallasch. Taken from the side of the Veterans Memorial, 2014 Arnold Classic.